The earliest financial accounts we have for the Smiths at Blackhall are found in an account book covering the years 1863 to 1865. I assume it was Thomas Smith who wrote the book’s entries, starting on 14 March 1863. This would have been about two and a half weeks before Thomas Smith took possession of Blackhall house and lands under a new lease signed on 2 April with the landlord James Murphy. The accounts book is interesting to read, providing a glimpse into the social history of people living about 150 years ago in rural Ireland. The lives of the Smiths are interesting to me, especially those who lived at Blackhall starting with Thomas Smith (see also the post about “Thomas Smith at Blackhall”). 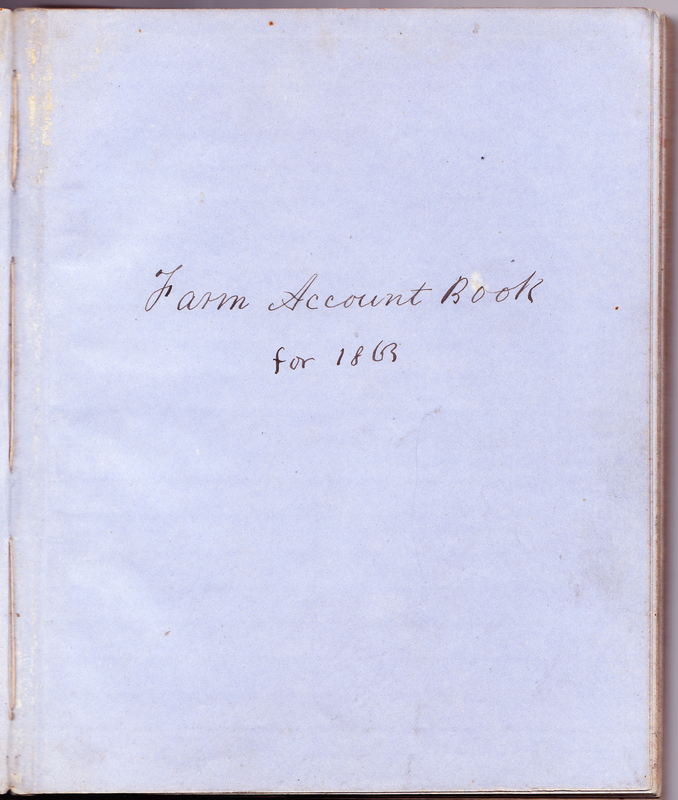 Thomas Smith tracked several types of items in this one account book: what he spent on the household and the farm; what he paid his farm labourers and who he paid; what he bought in livestock and other farm products (such as oats, wheat and so on) and who he bought them from; and what he sold in livestock and other farm products, what he received in payment and where the sales took place. The accounts are very detailed in 1863, and still detailed in 1864 (although the farm labour costs are omitted) but only part of 1865 is covered. I assume he kept track of his farm accounts some other way after about March 1865. (The latest entry I could find was in September 1865 and it related to money he apparently gave to his sister Mary Smith.) The book is interesting to read and I hope to convey some of this interesting information in this post and in several following posts. Before getting into the details of the accounts I think I need to explain something about comparing the value of money then and now. To explain it, I am relying on a useful website on measuring worth that provides different ways of measuring and comparing worth in English £s between the past and today. I am assuming that £s in Ireland were worth the same as in England then and now (which may not be true). One other thing to be aware of is the change to decimal currency in Britain in the 1970s. The old currency used the pound (£), shilling (s), and penny (d). There were 20 shillings in a pound and 12 pence in a shilling (therefore 240 pennies in a pound). The newer English currency has 100 pennies in a pound and is written as – for example – £1.50, meaning £1 and 50 pence. For commodities, I will use the most conservative equivalents in my post – in this case, the real price. When you see the prices that Thomas Smith paid for furniture and other household goods as well as for livestock, bear in mind you should multiply the price paid by about 75 times to be able to understand the price in today’s terms. For labour, it is better to use income value (or economic status) as a way of understanding what might be the equivalent in earning power today. So, for every £1 paid to a farm labourer in 1863, the value has been calculated as equal to about £771 in today’s terms. For those of my readers who don’t use English £s as your usual currency, you may want to do a second conversion from current £s into dollars, euros, etc. In 1863, starting on March 14 and going to the end of December, Thomas Smith’s household expenses totaled £465 9s 10d (about £35,000 today). These expenses included everything from furniture to food and clothing as well as the cost of hay and farm implements. His household expenses could be expected to be higher in the first year as he had to acquire furniture and other goods needed for the house and farm that would not be bought every year. The equivalent expenses for the full year in 1864 were £419 15s 0½d (£31,500 today) so that was a much lower rate of spending per month. The costs for farm labourers in 1863 were written in a separate section and, starting on April 11 and going to the end of December, the costs were £76 15s 8d (about £60,000 in income value today). Farm labour included the weekly wages for the men working regularly on the farm as well as a few boys and girls (unnamed); there were also a few men employed occasionally to cut hay, do carpentry and so forth. There is no separate account for labour costs in 1864 but we could assume they were roughly the same per month for a total of about £100. 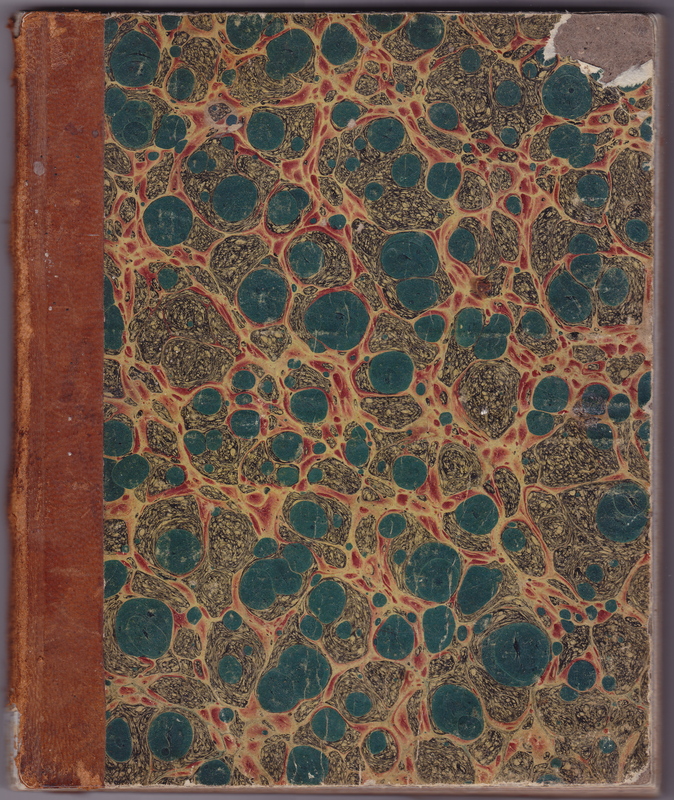 The third section in the accounts describes all the livestock (mostly cattle, some sheep, a few horses) that were bought and who were the sellers. From March 26 to November 8, 1863, £912 16s 9d (roughly £68,500 today) was spent on buying the livestock. In the full year of 1864, the livestock bought cost £1,892 10s 7d ( about £142,000 today) – a considerable expansion over the previous year. 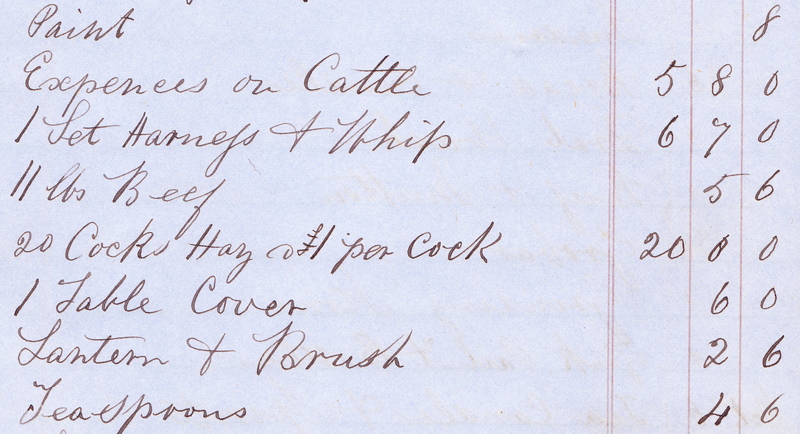 The fourth section in the accounts lists all the livestock and other farm products sold starting on May 30, 1863. Livestock was mainly cattle and sheep, with other products such as oats, grass and butter sold occasionally. The 1863 total in the “sold” section was £831 15s 6d (about £62,400 today). The 1864 total sold was more than about three times as high: £2,584 1s 8½d. Sales of livestock took place at Smithfield (in Dublin), Dublin New Market, Dunboyne and Summerhill (both near Blackhall), and – perhaps surprisingly – Liverpool. 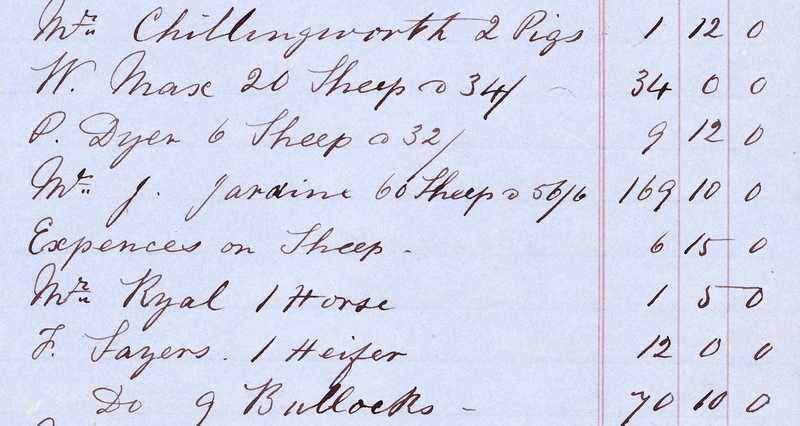 In summary, the total expenses for 1863 were £1,455 2s 3d while the income from selling livestock was only £831 15s 6d. So Thomas Smith’s first year (actually 9 months) at Blackhall was not a financial success but he was obviously going to do better as he settled in. He could expect to buy and sell more livestock in 1864 when he had a full year in which to do that. Happily, in 1864 the livestock bought was in the value of £1,892 10s 7d while livestock sold was worth £2,584 1s 8½d for a net profit of almost £700 (that would be about £52,500 in today’s currency). The profit would have easily covered the separate household and labour costs. There will be several more posts following this one, on the subject of Thomas Smith’s farm accounts.